ALL NIGHTS: General Admission tickets are always just $30. FAST PASS: On site prices for fast pass are $10 on green and yellow nights and $15 on red nights. Our on-site box office opens every night we are open at 6:30 pm. We accept cash and all major credit cards (Visa, Mastercard, American Express, and Discover). Online promo codes are not accepted at the box office. Want to save time and money by skipping our on-site box office? Buy your tickets online! Online tickets always offer the best available discounts. Please note that you must be on site by the entry times listed for the night you are attending. More information about our online tickets can be found here. No printer needed! We can scan your ticket from your mobile phone screen. Looking for a discount? You can find our brochures at many of our partner businesses in the region. Note – coupons are not accepted on all nights. Please refer to brochure for details. Small Group Rate: Groups of 15 to 49 Guests: $27 per person. Valid any night (although recommended, groups do not have to go through together). Not valid with other offers. There must be ONE person purchasing the tickets to receive this discount. No individual ticket purchasing for group rate. Large Group Rate: Groups of 50+ Guests: $25 per person. Valid any night (although recommended, groups do not have to go through together). Not valid with other offers. There must be ONE person purchasing the tickets to receive this discount. No individual ticket purchasing for group rate. 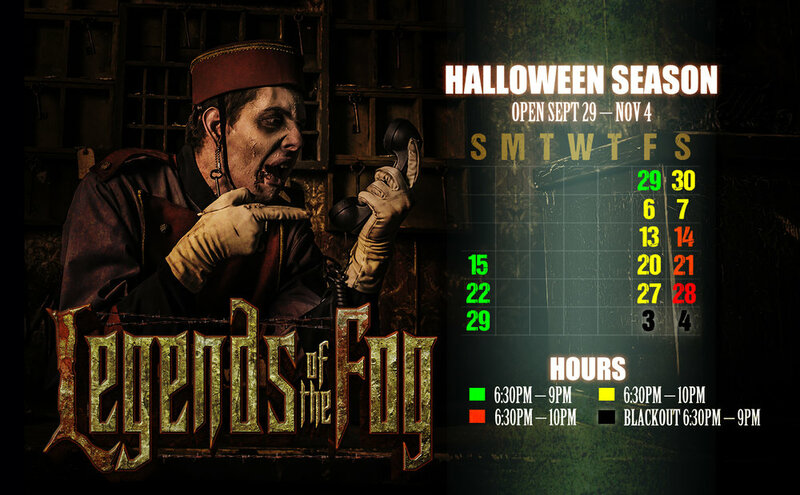 Large Groups may contact Info(at)Legendsofthefog.com to make promo code arrangements, group discounts, fundraisers, etc. Note: Times above are for box office and gate hours only. If you are in line at closing time, all events will remain open until the last customer has finished. If you arrive on site after the hours listed, no guarantees can be made that we will still be able to put you through the show.